Enjoy staying on a 1.5 acre of sun- filtered, park-like, treed garden, swimming in our Romanesque swimming pool or playing a round of golf across the road at the challenging Little Walmer Golf Club. 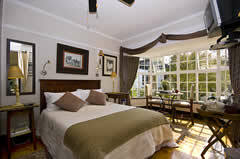 Elegant 4 star accommodation on Bed & Breakfast or Self Catering basis. All our units are en-suite having private individual entrances and patios. Forest Hall asssures you of a relaxing, friendly and secure stay in Port Elizabeth. We invite you to enjoy peace, tranquility and birdsong at Forest Hall, Port Elizabeth.